Our opening game of the Duel Decks: Ajani vs Nicol Bolas, I had no trouble at all finding an eager opponent. With Sam’s two favourite planeswalkers being the ones in this set, she already had her playmat and spindown die set up before I even broke out the decks. As we found in our analysis, the decks offered early-game advantage to Ajani, while Bolas steadily rose to power the longer the game went on. Would I be able to hold off the Nayan assault long enough to give His Draconic Majesty a chance? Sam’s on the play and has a solid start, playing a Loam Lion off of a Plains. I play a Terramorphic Expanse and crack it to fetch an Island. Sam next adds a Sapseep Forest which, in addition to giving her a ready supply of lifegain also counts as Forest. Her Lion now ‘activated,’ Sam sends it across the red zone to chew on me for 2. I play a Swamp and pass. Sam swings in on turn 5 with the Spitemare and I accept the trade for the Ogre, figuring I’ll take the pain now rather than later. This puts me down to 7 life, and Sam then replays her Loam Lion followed by a Jade Mage. Back to me, I snipe off the Mage before it has a chance to become a problem when I summon Shriekmaw. Next turn Sam deploys a Qasali Pridemage, then attacks with the Lion for 3. My turn, sadly, is a blank. Now turn 7, Sam attacks with the Lion again, and I kill it with a Malice. She then plays a Sylvan Ranger and passes. Unable to do much on the ground, I instead try and hit at her hand with Fall, revealing Vitu-Ghazi, the City-Tree and removing her Titanic Ultimatum. I then play a second Obelisk of Grixis and pass. Sam next attacks in with the Ranger, now a 2/2 thanks to the Pridemage’s exalted, and I trade it out for Shriekmaw. She keeps the pressure on with an Ajani’s Pridemate. Back to me, I play a Morgue Toad and pass. Sam makes sure to gain a life with the Sapseep Forest at the end of my turn, and the Pridemate gains a +1/+1 counter. Sam gains another 1 life on turn 9, then sends in the Pridemate and Pridemage. I trade the Pridemage for the Toad, bouncing the Pridemate back to her hand with Vapor Snag. Naturally, she replays the Pridemate and passes turn. I find a solid defender in the Jhessian Zombies and so am safe for another turn. Next turn, however, Sam plays a Canyon Wildcat, whose mountainwalk is big trouble for me. Short of answers, I refill my hand a bit with Deep Analysis and end turn. Sam gains 1 life at the end of my turn, then gains another on hers. Again, a 4/4 Pridemate hurtles through the red zone. With no choice but death, I chump my Zombies to stay alive. Back to me, with nothing to lose I flashback the Deep Analysis, going down to 1 life. I then play a Steamcore Weird, sending the damage to Sam for lack of any better place to put it. Sam topdecks a win on turn 12 with a Lightning Helix, though I’m ready with the Countersquall to deny it. But all I’m doing is delaying the inevitable, and I fold two rounds later when I can’t keep the ever-growing Pridemate at bay. On the play, Sam and I take turns developing out land until Sam opens her board position with a turn-2 Canyon Wildcat. She swings for 2 on turn 3 then attempts an Ajani’s Mantra, which I Countersquall. Next turn I play my own first creature, a Surveilling Sprite, which I immediately trade with the Wildcat while I still have the chance (I’ve yet to play a mountain). Sam replaces one cat with another when Ajani’s Pridemate comes out, and I’m thankful for having managed to kill off the Mantra. Now turn 5, I’ve now missed two land drops in a row. Eager to stabilise, I deploy a Morgue Toad. For her part, Sam more than one-ups me with Marisi’s Twinclaws, and I’m in some trouble. Back to me, I play Rise to bounce the Twinclaws and exhume my Sprite back to hand. Sam plays an Ageless Entity. I replay the Sprite on turn 7, happy to chump it in hopes of drawing a land. Back to Sam, she plays a Loxodon Hierarch, immediately making her Pridemate a 3/3 and the Entity a brutal 8/8. She swings with both, and I chump the Entity with the Sprite. I’m now down to 15 life in a very grim game. Back to me, I kill off the Entity with a Malice, and with nothing else to do I pass. Sam attacks for 7, cutting me to 8. She then brings out Ajani Vengeant, and builds him by freezing my only Mountain. In sheer desperation, I pop the Toad on turn 9 to cast Slave of Bolas on her Hierarch, which she smartly sacs in response to deny me the prize. Back to Sam, she uses Ajani to freeze a Swamp this time, then casts Lead the Stampede, landing three creatures. She plays one of them- a Woolly Thoctar– and after my next turn’s Deep Analysis reveals nothing of use, I scoop. In our pre-match ‘friendly’ Nicol Bolas absolutely dominated Sam, and so I know that the deck can certainly run better than it has thus far. With that home in mind, I lead with a Terramorphic Expanse, which I snap for a Swamp. Sam deploys an Essence Warden, a nice opener. I play a Mountain and pass, then she swings in for 1 with the Warden. Now turn 3, I stabilise with a Hellfire Mongrel, and Sam’s next turn is a blank (though she gains a life for the creature entering the battlefield). Next turn I finally get the edge in momentum as I play a Blazing Specter, attacking with it alongside the Mongrel. This drops Sam to 18 life, and she pitches a Kird Ape to the Specter’s discard effect. Still, she untaps and brings out Ajani’s Mantra. I keep the pressure going on turn 5, but with the Mantra and Warden in play it’ll be some slow going. Still, the hand disruption from the Specter makes it more than worth it, and this time she pitches a Lead the Stampede. Back to Sam, her turn is a blank and she passes after drawing. I swing in for 4 more on turn 6, forcing Sam to pitch a Searing Meditation (thus far she’s without any Red mana sources whatsoever). I then play a second Hellfire Mongrel and pass. Sam then lands an Ajani’s Pridemate which promises to get very big very quickly if not answered. Still, I have momentum on my side and I keep up the attacks in the sky. Sam’s down to 12 life on turn 7 as my Specter sails in overhead, and she tosses the Canyon Wildcat. Back to her, the Pridemate is now a 4/4 and she sends it in on the attack. I hate to do it, but I have no answer in hand for it so I gang-block with both Mongrels- a risky move. Still, Sam has no tricks in hand, and didn’t seem to expect that I’d force the trade. All three head for the bonepile. Next turn she’s hit for 2 more and loses a Nacatl Hunt-Pride to the Specter. Defiant, Sam sends in the Warden to poke me for 1. After another hit from the Specter (forcing the loss of a Fleetfoot Panther), I follow up with a Dimir Cutpurse. For her part, Sam gets a solid defender in the Loxodon Hierarch, and her life bumps back up to 16. Still, I’ve drawn some removal and use it- a Shriekmaw- to kill off the Hierarch. Both the Cutpurse and Specter strike in, and Sam’s last two cards in hand- Briarhorn and Ajani Vengeant- are placed into the graveyard. From there it’s a simple matter of whittling Sam’s life total down. She plays everything she gets, losing only things she can’t play (like a Lightning Helix). I further hamstring her by taking out a Forest with Suffering, then go in for the kill with a Profane Command for 6. I love Grixis colours, and discard is perhaps my favourite strategy of all time. So it shouldn’t be surprising, then, to learn that I loved playing Nicol Bolas’s deck, even if I ended up 2-2 on the night (the three plus our friendly). What did surprise me, however, is in the area of weakness in this particular Duel Decks package, and it was one I didn’t anticipate until I actually shuffled up and played. Many years ago, I was a fan of a minor-league (AHL) hockey franchise, the Beast of New Haven. It wasn’t the most enjoyable hockey in the world, despite the ready supply of beer at the stadium, but it took me some thinking to put my finger on why. The answer, I found, was particular to the sport. Typically when watching minor league athletics, the reduced talent and ability of the players is offset by the fact that the other team plays at the same level. The hitters might not be as good as those in Major League Baseball, but that’s okay because the pitchers aren’t as good either. Despite the fact that most players on the screen wouldn’t cut it in the NFL, college football remains a huge enterprise and entertaining game. So what’s the problem with hockey? Why the difference? And then it dawned on me. Hockey, unlike say baseball or football, has a third factor for which no amount of balance can compensate. Passing skills, checking, shooting, checking… these all tend to balance out on the ice. But what about the ice itself? And there it was: skating. You can take a half-dozen Gretzky-level talents and put them on each side of the ice, but if they can’t skate well then it’s not going to be a good game. And that’s what we saw watching The Beast. Players overskating. Missing the puck. Not being quite where they needed to to pick up an assist. Larger turning radii. Less maneuverability. And so on. And that’s where both Ajani and Bolas seem to struggle. However evenly matched they are- and it certainly feels that way from the decks- there’s still that ‘third factor’ that can hinder the fun factor of the decks. Namely, their manabase. Each of the decks is three-coloured, and the last (and only) time such an ambitious manabase was attempted in a Duel Deck (The Coalition) you had a ton of mana-fixing in a Green-base deck. To be fair, Ajani has a splash of it, but Bolas gets very little indeed. The idea for Bolas, of course, is that time is his mana-fixer. he doesn’t need a lot of cards to be devoted to fetching him land, he just needs to stall out the board long enough and the lands will come. 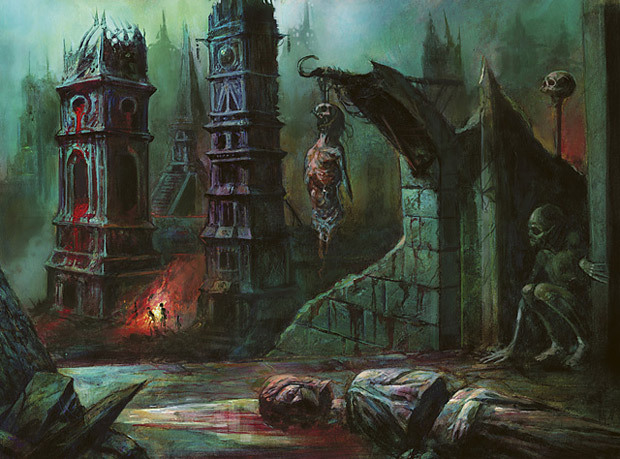 Time and time again I felt like I wanted to rip the deck apart and stuff in leftovers from my old Cruel Control deck: Dragonskull Summits, Drowned Catacombs, Scalding Tarns, and heck, maybe a Creeping Tar Pit or two and gut the deck of much of its basics. Although it’s true that both decks are fairly even with their manabases, the heavy reliance upon basics means that it won’t be an uncommon occurrence for once deck to simply stumble out of the gate as the other gets the colours it needs. This can trump the fine balance the designers struck in making the deck aggression versus control. In the games above, mana shortages and asymmetries played a part in each game, and its not hard to guess who had the difficulty. That aside, it’s a worthy endeavour to try and diversify the Duel Decks products, for the majority of them indeed have been mono-colour decks with one recent two-colour (Knights). And beyond the manabase, the deck is a lot of fun to play. As seen in the third game, Bolas is not without some very aggressive early plays of his own, with a single Specter managing to have Sam discard eight cards over the course of the game. There’s enough removal to stay competitive with Ajani, and the discard strategy is a blast. Overall, this is one of the more fun Duel Decks we’ve played to date. 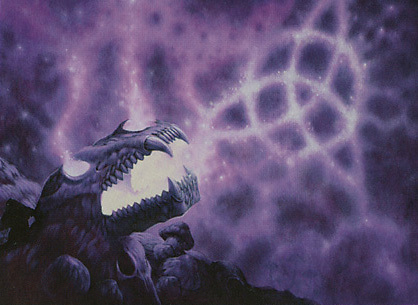 Got to say, I do prefer the original Bolas art. Operatic is quite the way. Maybe if there was a little guy in his raised hand like Bolas was toying with them? I don’t know. Too bad the original art is like 20 bucks on coolstuff or I’d grab a pair. Glad they put the tri-land in it as well as a rupture spire. Though I’d prefer 2 of each. That extra spire would have helped. If there were 2 Nightscape Familiar, it would have been even better. I like the deck. It’s a good start. I mashing 2 and I think the results are going to be quite fun. I’m not surprised it went 2-2. These decks seem decently balanced. Not too sure about the Rupture Spire. In my experience playing it, it always sat in my hand, right next to a counterspell. Playing a land and missing two mana (one to pay for RS, the other one being RS entering play tapped) seems kind of a risk. I would then rather have a Shimmering Grotto or something. Knowing they wouldn’t give a playset of anything, yeah, but if it was a spire or two or more basics, I’d take the spire all day long. I normally consider RS for 4 or 5 color decks. 3 color if I can run a shard tri-land, I pop 4 in and go from there. I prefer the new Bolas artwork. His spreaded wings looks mighty and scary. There is more in this picture when you look closer than it seems at the first time. It is well thought image. 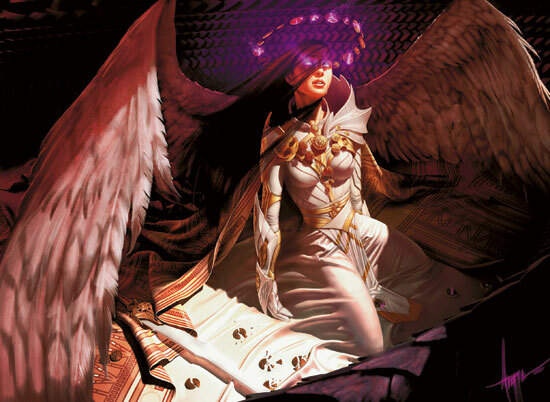 Both planeswalkers from this set have better artwork than orginal imo. Cards selection is very good. There are not pricy but match the theme very well. It is my favourite of all duel decks. P.S. Sorry for my poor english but it is not my first language. Welcome! 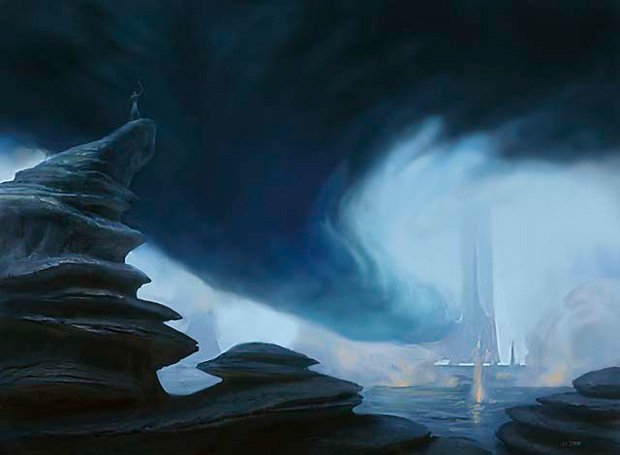 Looks like I need to find a higher resolution or even just larger new Bolas image. Yep. Discard is a fun way to play. I remember playing 4x Megrim with some Hypnotic Specters, Diabolic Edicts, Dark Rituals and Nightmares. Keep your opponent from playing their better spells and when they finally do, kill it using an Edict or Terror. Usually the Nightmare could just fly over and go for the kill. Yeah, shoulda had the full playsets of Crumbling Necropolis and Jungle Shrine instead of the janky Rupture Spires and Evolving Wilds. I bought this duel set recently and enjoy it a lot. Both have nice combos and interactions. But so far I feel that Bolas is weaker. Ajani usually has more big hitters to scare Bolas, then the dragon has answers.